We’ve all seen this story several times. 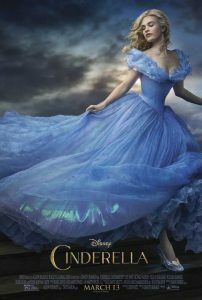 Just a few months ago, Cinderella was featured prominently in the musical “Into the Woods.” Now there’s a new Disney version that’s been a hit with both audiences and critics alike. Why should we see this version? Directed by Kenneth Branagh, who has given us everything from Shakespeare to Thor, the new “Cinderella” has been given a first-rate production on all counts. Oscar-winning actress Cate Blanchett plays the cruel stepmother to perfection. Lily James, from TV’s “Downton Abbey,” is a lovely Cinderella, who endures the loss of her parents and cruelty of her stepmother and stepsisters. One thing that sets this version apart from many others is that it’s not played for laughs. The many pop culture references we’ve been used to seeing in family movies are missing. That’s not to say that it’s devoid of humor, but in Chris Weitz’s screenplay, the human drama is at the heart of the story. With its emphasis on the virtues of courage and kindness that Ella’s dying mother passes on to her, this “Cinderella” resembles a Jane Austen study of virtues. The Fairy Godmother first appears as a beggar woman, who is given something to eat by Cinderella. It’s only then that the Fairy Godmother reveals herself and makes impossible things happen. Another major aspect of Branagh’s production values result in a stunning production. Oscar-winning costume designer Sandy Powell has imagined wonderful costumes for her characters. The stepmother’s emerald green ball gown reflects the coldness and envy in her heart. When Cinderella appears at the ball in her exquisite blue gown, no one would doubt that every eye would be on her. Even though the next Oscars won’t be handed out for almost a year, it seems that the winner of the costume design category has already been decided. Another Oscar winner, Dante Ferretti, did a great job designing the sets, which compliment the costumes handsomely. No doubt he will also be a contender for the next Oscar as well. When I left the theater, an usher told the exiting audience to come back in two years when the next version of Cinderella will be released. He may be right. But for now, this version will do very well, thank you.